* Crossovers must be between Buffy and another show. A crossover between Buffy and Angel does not count as they are essentially the SAME fandom. ** Best Series - if the author refers to each part as a chapter, then it's a story, not a series. If each part is referred to as a story (or a story with 2 or more sequels), then it is a series. *** Nominees in the Best AU must have a major difference with canon! Fic set in a previous decade or Willow's the slayer or Willow's a cheerleader, etc. are wonderful examples of AUs. Small divergences with canon -- ie- Willow's not gay or Willow and Xander don't fluke -- do not count. If you're curious if a fic counts, email Elisabeth. 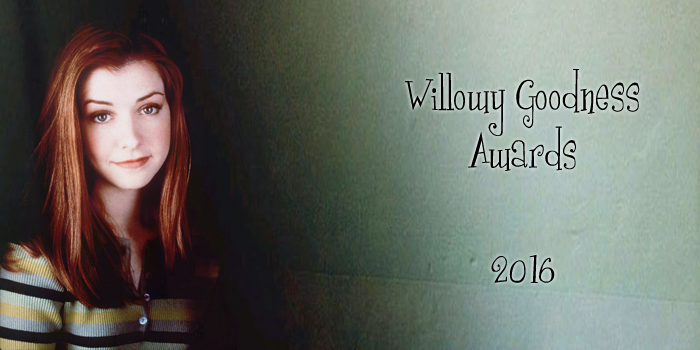 **** Best Evil Willow Characterization means any Fic where Willow is a) NOT a vampire and b) IS the "Big Bad". The Willowy Goodness Awards are brought to you by Elisabeth and Hairy Eyeball, who has taken over from Willow's Lil' Secret and Jen. Originally brought to you by Near Her Always (the Willow Character Zone of the BtVS Writers' Guild) and Kaz. and any original characters. Please don't sue, we're all broke.